SNOEK & HAGENS will have a show in Paris September 2019. With her familiar use of form and color, painter Sasja Hagens shows her latest series of paintings, in collaboration with artist/designer Saar Snoek at the Excellent 2018 fair in Ahoy Rotterdam. The series of wall sculptures includes a combination of organic randomness and mechanical precision. Authentic craftsmanship in material use of hand-painted silk, wool, steel and brass in a refreshing interaction with innovative lasercutting techniques. Inspired by the School of Kanō, a Japanese art movement from the 15th century, Snoek and Hagens show their latest work on wooden panels. Artist / painter Sasja Hagens lives and works in Rotterdam. In 1992 she was selected for the Royal Academy of Art in The Hague, where she graduated in 1996. Since then, she has exhibited her work in a.o. Hong Kong, Basel, Helsinki and Milan. She also had a successful solo show at The Duolun Museum of Modern Art (MoMa) in Shanghai. Her work has been purchased by for example Maritime Museum Rotterdam, Deloitte, AKD Advocaten, ABN AMRO, Arcadis, Damen Shipyards and City Hall Rotterdam. Artist / designer Saar Snoek won the World of Wearable Arts Wellington (New Zealand) award in 2017 and her work was also included in the highly praised WOW collection. This year she was also the finalist of this international design competition. Finally, she exhibited with her project Prayer Rugs in Richmond Virginia USA and Doha, Qatar. 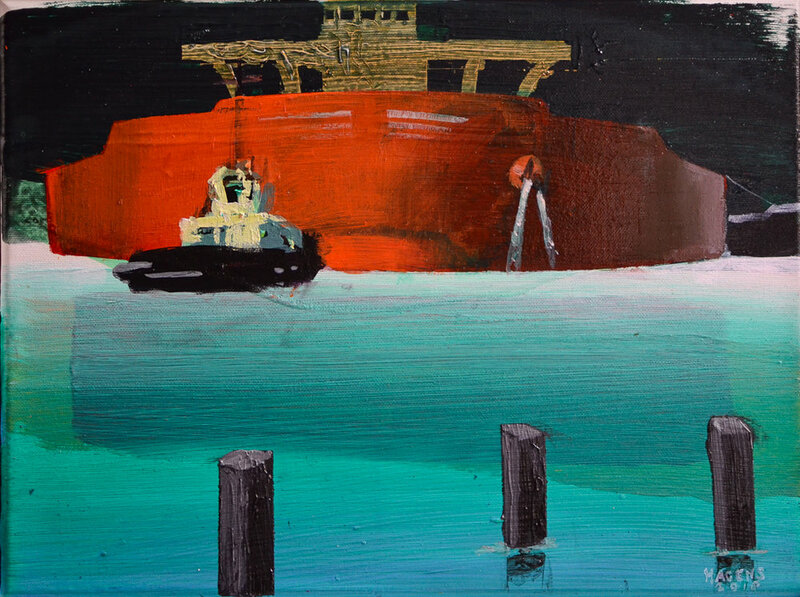 This summer and fall of 2018 I'm working on a series of 8 paintings for Damen Shipyards. The paintings will be given to brand new Damen shipowners. From left to right: Isabelle Ryckbost (ESPO), Pat Cox (chariman Jury ESPO Award), Philippe Kalil (Guadeloupe), Viviane Francois-Julien (Guadeloupe ) and me (design ESPO Award). By giving residents the opportunity to visit historic buildings or by turning port facilities into art and cultural venues, we encourage people to come and get to know their port and gain a full sense of ownership of it in a different way.